A homesick alien and a severely injured man are ready to deliver a new message: "No One OutPizzas the Hut." 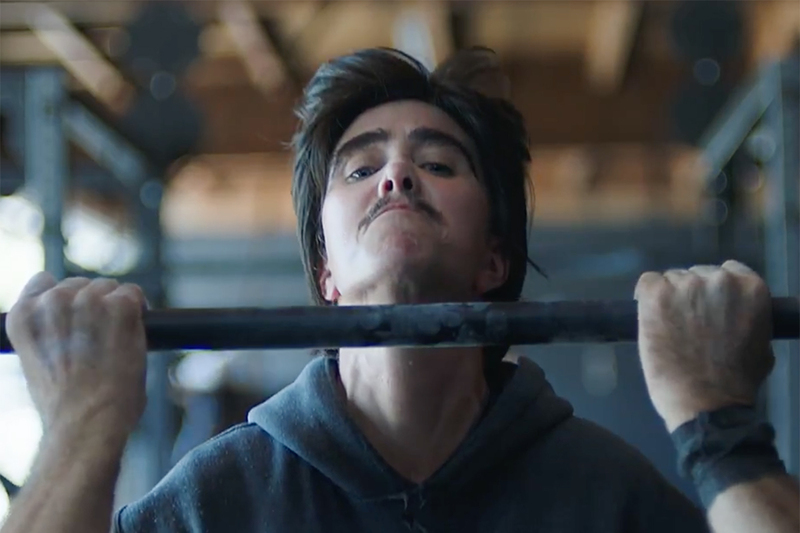 The latest tagline for the largest pizza chain appears in a campaign debuting Thursday that marks Pizza Hut's first work from Droga5. 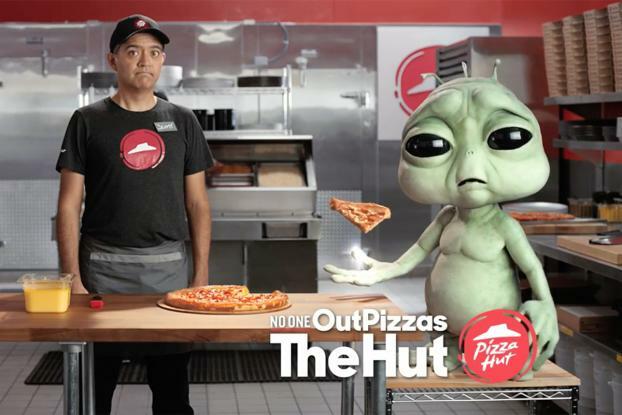 "Pizza Hut makes the best pizza in the entire universe, but they won't tell you that," the homesick alien says in 30-second and 60-second (see above) commercials. In another spot, a man in a full body cast implores a Pizza Hut worker to "eat every slice like it's your last!" The TV spots were directed by Adam & Dave via Arts & Sciences, with tabletop by Trevor Shepard out of Woodshop. They center around the chain's latest stuffed crust marvel, pizza with a crust stuffed with cheese meant to resemble a grilled cheese sandwich. "The grilled cheese stuffed crust is a product that is out of this world. 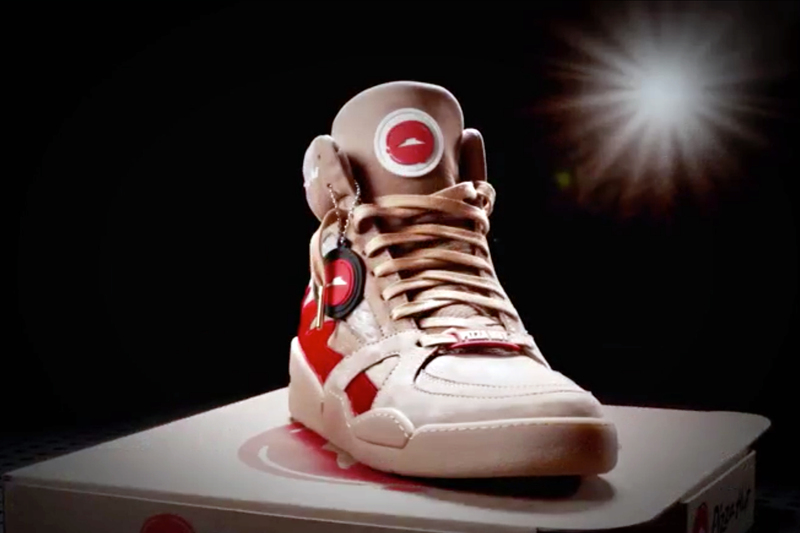 It is that good," said David Timm, Pizza Hut's U.S. chief marketing officer. "So why wouldn't you have an alien to be able to say it's the best in the universe?" Radio commercials include a romance novelist bragging about the chain's "seductive pizzas" and a man ready to be rescued from Mt. Everest who longs for the warmth of two Meat Lovers pizzas. The campaign still includes pricing details, but aims to make the products the focus rather than drilling in on convenience, technology and value, which have all gotten more attention across the broader pizza category, Mr. Timm said. "We feel that we are the brand that has the right to really champion and hero the pizza again," he said. Pizza Hut, owned by Yum Brands, brought on Droga5 as its lead creative agency in May after working with Deutsch since the summer of 2014. Pizza Hut's U.S. same-store sales rose just 1% in the second quarter after a 5% jump in the first quarter. In July, Yum Brands CEO Greg Creed attributed some of the slower growth to competitors responding to the chain's first-quarter strength with more aggressive promotions. At that time, Mr. Creed mentioned that Pizza Hut was working with a new advertising agency and said: "I think the Pizza Hut team would agree we can do a better job of communicating both better and easy." 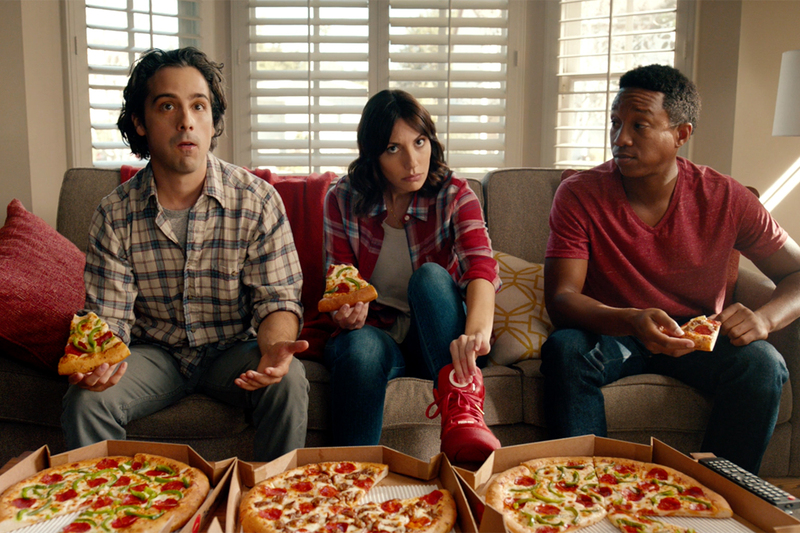 Scott Bell, group creative director at Droga5, said the new tagline, "No One OutPizzas the Hut," was part of the agency's pitch. 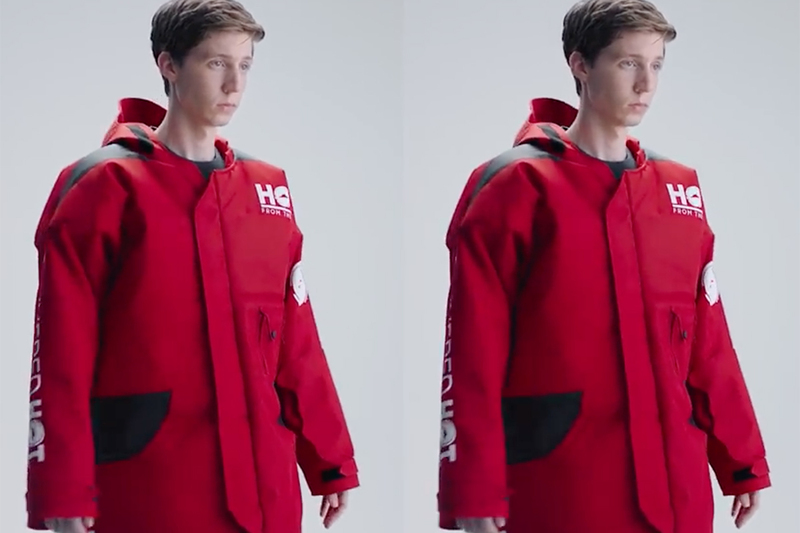 The idea to use others to brag about the product, including the alien and the injured man, ties into the idea that "they really truly are a very humble company" and would not boast about the products themselves, Mr. Bell said. Using characters gives the brand the chance to let someone else do the bragging. For now, TV is the main focus, along with radio spots. Social and digital elements may follow.